Of those eight free se ttlers who arrived in Australia on the Coromandel in 1802, six were Scottish. Only John Howe and William Stubbs were considered to be English. John Howe was from Redbourne in Lancashire & William Stubbs ancestry is not known, though he may have been from Northumberland of Scottish descent, as was the case with many many Northumbrians in the 17/18th centuries. Of the fifteen families involved in the construction of the old church 1808/09, it's a fact that they all became related, by marriage and birth, one way or another. In those early days there were very few young people in the colony, so choosing a partner depended on one’s means of transport. It was either a boat up and down the river or by horse, if you could afford to own one. 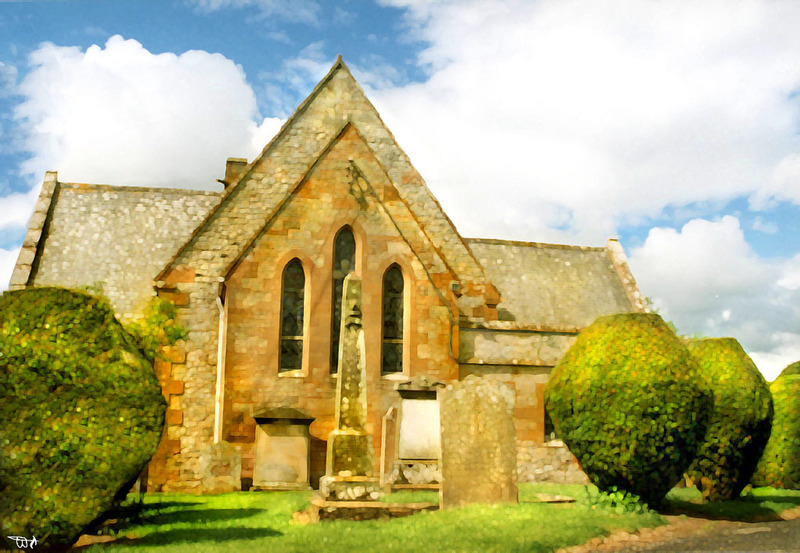 An excerpt from, The Churches and Churchyards of Teviotdale. Concerning the old church of Bedrule we know very little. About the earliest notice refers to 1479 when James Newton was parson of Bedrule. It is recorded also, that in 1482, James Rutherford of that ilk obtained a charter of the patronage. Subsequently to the Reformation. it was attached to the barony of "Edgarstoun", and belonged to the Earl of Traquair, who ,had at the same time the lands of Rutherford. The present building occupies an elevated situation on the right bark of the river Rule, two miles above its junction with the Teviot. It was restored in 1876. Only a portion o' the old walls remains, while a vestry and porch were added. The surrounding scenery is exceedingly fine. From the church an excellent view is to be had up the water to Hobkirk, over to Cavers parish, and across the Teviot to Minto. From the vestry window is obtained one of the finest views in the South of Scotland, including the beautifully wooded estate of Wells, which lines the skirts of Ruberslaw, while the dark hill itself towers up far above, and its rugged peak from this point presents the most picturesque appearance. In 1621, King James I of England, renamed the islands off the eastern coast of Canada from Acadia to Nova Scotia. Eight years later groups of Scots settled at Charlesfort, near Port Royal, and at Rosemar, on Cape Breton Island. From the 1770’s to the 1830’s, a large emigration to these islands began. Nova Scotia became a British colony with new settlers. It was a promise of a better life for the Scottish Highlanders as land ownership in Scotland was rare. They were promised 200 acres of land when they arrived. Some were allocated much more. This new land had been recovered from the French settlers, who had been forcibly removed by the British a little earlier. Most were returned to Europe, however, some settlers went westward to new uncharted territory now known as Quebec. Others escaped and went into hiding until the pressure of being deported was over. The New Scottish and Irish settlers were located around the Bay of Fundy, Cape Breton Island and along the coast of the Northumberland shores. Yet another island also became very popular for emigrants. This was the northern and nearby Prince Edward Island. The Gaels made their communities very homogenous and, as a result, made up a large and culturally diverse Scottish influence throughout these islands. "From the pavements, from the windows of houses, and from trams, buses and motor cars, whose, occupants for once cheerfully, acquiesced in a traffic hold-up. Glasgow folk watched a long chain of fire pass on Saturday night from the Cathedral to the heights of Gilmore hill." Thus the writer in the Glasgow Herald of January 8, 1951. described; a seen that had its beginnings over 500 years earlier, in Roxburghshire. For in the tiny hamlet of Bedrule, between Hawick and Jedburgh, was born William Turnbull who became 25th Bishop of Glasgow from 1448 to 1454, and the man responsible for the founding of Glasgow University in 1451. So it was appropriate that when the University was, celebrating its 500th centenary, a thread of fire symbolising the torch of learning should have been carried by a relay of 12 runners over the 100 miles from the Borders to the city. Copyright © 2015 Turnbull Clan Association. All rights reserved.